Update: Cap'n Crackers is now for sale for $10 on the shop. 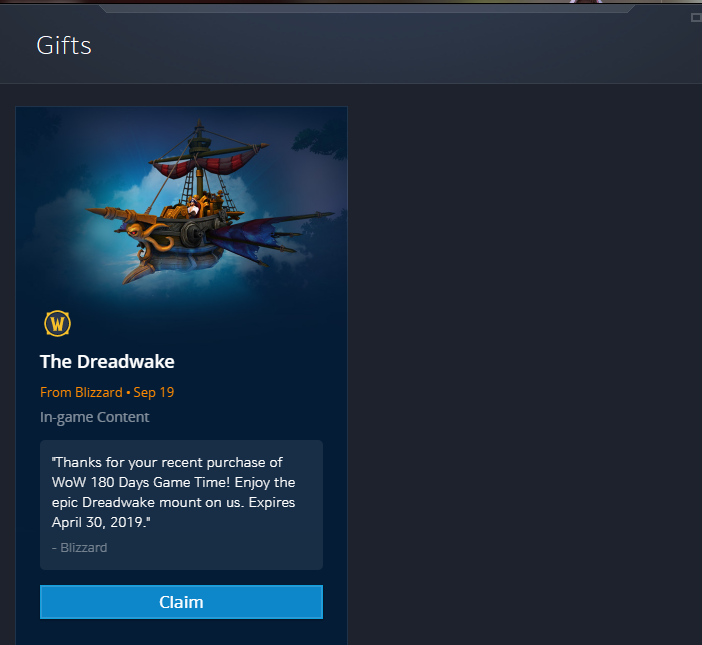 Update: You will receive The Dreadwake as a reward for purchasing 180 days of game time between today and 10/21/2018. It will be a shop mount sometime in 2019. We're Gone Fishin' in This Week's Tavern Brawl! 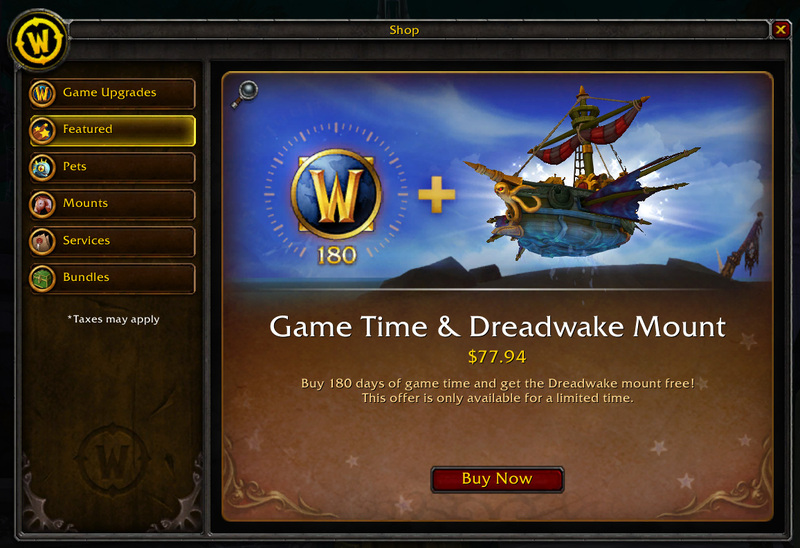 The Dreadwake was hotfixed into the game today as a reward for purchasing 180 days of game time between now and 10/22. Cap'n Crackers / Cap'n Crackers were hotfixed into the game today and are on sale now for $10. Players on an existing recurring subscription plan who purchase 180 Days Game Time will have their next billing date automatically adjusted to align with the addition of this time. Players who already have game time on their account will have the 180 days added to their current total. By purchasing 180 Days Game Time, you’ll also save up to $24 per year. **Must have purchased current 180 Days Game Time service on or before 12:01 a.m. PDT on September 19, 2018. Pirate's Day is back again! Nothing new this year, but it was updated last year. Check out the little beach party just south of Booty Bay! The Jolly Roger toy is back again! It is purchasable from Edward Techt for those that have completed Avast Ye, Admiral!. You can purchase Big Bag of Booty from Dread Captain DeMeza to transfer gold between servers with a 5% loss. Kill Ol' Eary to get the Slightly-Chewed Insult Book toy. Hoist sail and make way for Booty Bay because it’s Pirate’s Day! Pirates have taken over the goblin town of Booty Bay and Captain DeMeza is recruiting any scurvy dog she can into her buccaneer ranks. Visit her or her henchmen in the capital cities if the pirate’s life is for you! Feeling out of place in Booty Bay without a proper costume? Don’t worry. /Dance one little jig with the Dread Captain DeMeza and she’ll be impressed enough to press you into her crew and outfit you properly. If you get attached to your new look, you can do the quest You're Gonna Need A Bigger Boat!! Succeed, and you’ll get an Emergency Pirate Outfit (or five) for when Pirate’s Day is but a distant memory and your inner pirate is clawing to get out. 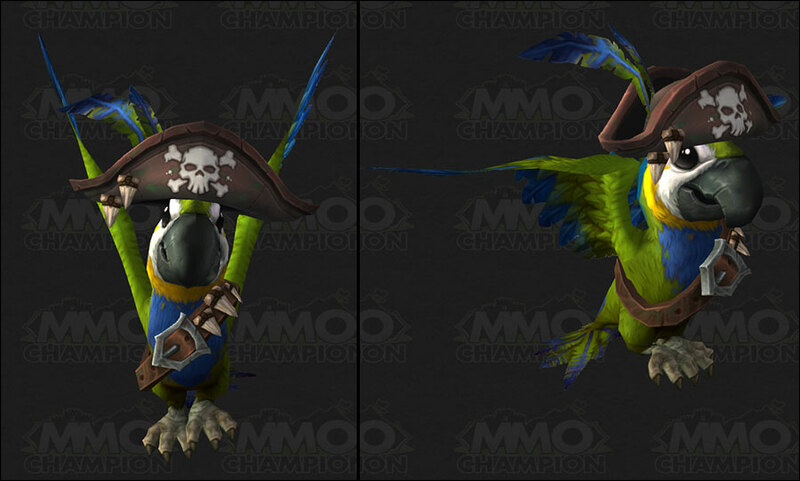 What good is a pirate without an avian companion on their shoulder? Captain DeMeza (for the exchange of a few shiny coins) can help you call forth a temporary companion named Petey to take with you wherever you sail. From time to time the captain will shout for a brave party to take on a terror of the deeps–an elite shark known as Ol' Eary. Make sure you have a hearty crew with you or you could become just so much chum in the waters of the bay. 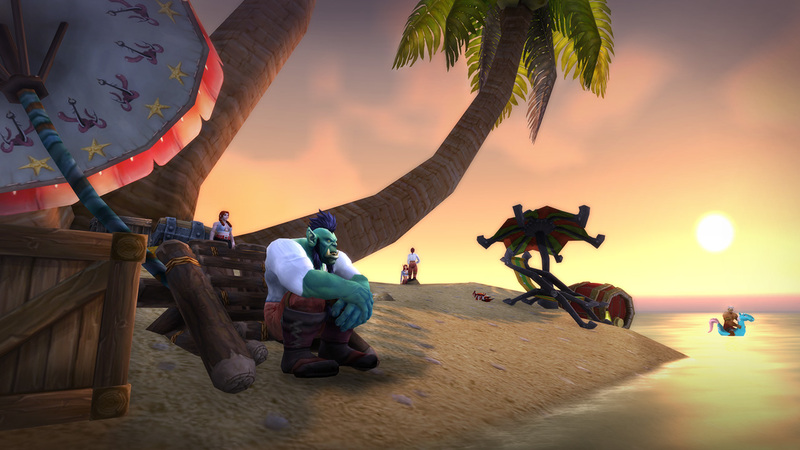 Once you and your crew have helped the captain handle Ol’Eary, you can celebrate with the crew at a little beach party just south of Booty Bay. The exalted among the Bloodsail Buccaneers can also purchase a toy from Edward Techt–the Jolly Roger-to show off their dedication to the cause. If you’re really feeling generous, you can also purchase a Big Bag of Booty from Captain DeMeza and spread the wealth around to all your pirate pals in a burst of glittery glory. Surry Alaians we make le thematic munts and horses fit Kul'tiras so good. Here, let Schlomo sell you this many shekel worth pirate ship that totally would not fit Kul'Tiran experience. Le enjoy. I got the ship as a gift for buying 6 months of game time as well. That's bull. Been subbed every month since I started in TBC. But since I can't afford to do 6 months in one go I can't get this. This, a thousand times this! I need answers! It's 6 months in one shot. I've been subbed every month for the last 12 years and didn't get it. if you buy 5 tokens and use them for $15 balance you can purchase a 6 month sub. that's what i did. 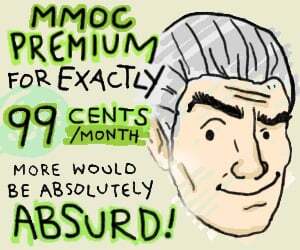 it actually saves you because it only takes 5 tokens instead of 6 if you do month to month. Avast you scurvy dogs! Will this plunder be available as a bundle? Theyre just trying to lock in subs to prevent a flood of people leaving, its pretty clear thats the motivation. "(Evil Ion) - People are quitting BfA already, we need ideas to keep the subscriptions! (dev 1) - Fix the bugs! (dev 2) - Fix class balance! (dev 3) - Add meaningful content! (dev 4) - Make the game less grindy! (dev 5) - Create a freaking badass mount and add it as a reward for a 6 months subscription." Dev 5 was promoted that day, and nominated employee of the year. I'm surprised that more people aren't angry about them sticking a mount on the shop so soon after the expansion's release not to mention how poor it's been. Anyone know how to transfer gold between servers with Big Bag of Booty from Dread Captain DeMeza?? ?